When staying on our Holiday at the Haven Holidays site in Ayr, we also visited Edinburgh castle. It was a longer drive compared to Dundonald Castle, which we had already visited. It was however worth driving that bit further as Edinburgh Castle is quite an impressive castle. 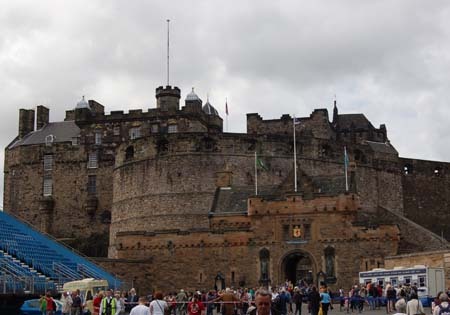 Edinburgh castle has many advantages over most other castles when it comes to access in a pushchair, but still has a number of other challenges if you are not prepared for them. Firstly we followed the signs to the official castle car park. This is a multi-story car park at the bottom of the hill to the castle. We parked on the bottom level as there was road access out at that level and it looked like it may have been a good place to go out with a pushchair. This was however not the case as the path up to the castle had a sign saying it was closed. When we reached the top of the path (through a different route) it appeared to be open, but then later on it was locked, so this seams to be a path only open at certain times of the day. We therefore had to carry the pushchair up a flight of stairs to the upper road level to follow the road up to the castle. We then followed the road up, which was fairly steep and passed a number of coaches where the passengers had all spilled over the pavement. We were able to get passed them, with a bit of weaving through. As we got close to the entrance to the castle, there was a very large flight of stairs. This was the most direct route, so we went up the stairs with the pushchair, although found out later that if you don’t mind walking quite a bit further you can follow the road up towards the City and then double back towards the castle avoiding the steps. Upon entering the castle there is a roadway that winds up to the top of the castle so it’s possible to go through the main part of the castle without going up or down any stairs, although as you would expect you do need to go up some steps depending upon what you want to visit. There are lifts in the Military Museum of Scotland and to see the Scotland Crown Jewels (although you need to ask for assistance as you have to follow a different route to see the Crown Jewels). For my part I left my wife with the pushchair and carried our daughter around some of the parts of the museum. We ate in the Redcoat cafe about half way up the castle. It was quite expensive but the food quality was excellent. Highly recommended if you don’t mind splashing out a little. 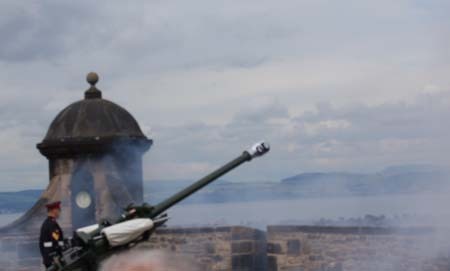 At 1pm on each day, except for Sundays and certain occasions, the One O’clock Gun is fired. Whilst I had heard of this we hadn’t really planed around it, but just happened to be by the Redcoat café as people were milling around waiting for the firing of the gun. Suddenly realising what the time was we watched the firing. When the gun was actually fired it was extremely noisy, far more than I expected. Whilst it made our daughter jump it didn’t seam to bother her as much as I thought it might. Baby changing facilities were available in the castle. We used them in the cafe and in the main toilets by the main entrance to the castle. The exhibitions weren’t really geared towards young children, but then neither did our daughter seam to get bored. After visiting the castle we ventured into the City, specifically the area near the castle dominated by tourist shops. In contrast to the castle this was far less baby and child friendly. Few of the cafes seamed to be very child friendly with many not having enough space to take a pushchair in. We found a coffee bar eventually where we had a coffee and cake. It was also a challenge trying to find a baby changing facility. We ended up asking some police officers who were not aware of any but suggested the railway station. To get to the railway station involved going down a very steep road, not a problem going down, but quite a climb to return afterwards. Thankfully the railway station did have a baby changing facility, and we were allowed to use the baby changing free of charge, whereas there was a charge for using the normal toilets. This entry was posted on Saturday, September 1st, 2007 and is filed under Babies, Children, Holiday, Tourism. You can follow any responses to this entry through the RSS 2.0 feed. Both comments and pings are currently closed.